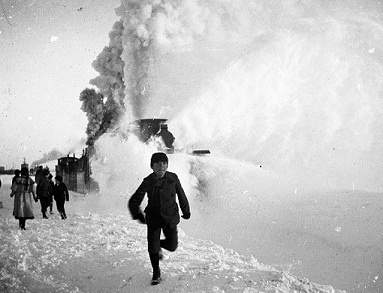 This photo shows a child running from an approaching snowplow, pushed by a train, near Redfield, taken in 1897. This image, from a glass plate, is from the Lester Black Collection held at the South Dakota State Archives at the Cultural Heritage Center in Pierre and recently made accessible via the South Dakota Digital Archives. A grant received for the scanning of glass plates has made almost 600 images from a photo collection of the South Dakota State Historical Society-Archives at the Cultural Heritage Center in Pierre available to the public. The grant allowed for the scanning of 589 glass plates from the Lester Black Collection. The images date from the late 1890s to 1910s. The State Historical Society received the glass plates in 1986. The digitization and cataloging of glass plate negatives has been funded in part by a grant from the City of Deadwood and the Deadwood Historic Preservation Commission. In addition to the Lester Black Collection, other glass plate negative collections that have been digitized include the Myra Morton Miller, Eliza Dibble, and Wandell Mooney collections. Specific locations found within the Lester Black Collection include the Redfield College, Mount Rushmore, Devils Tower, Corn Palace, Sylvan Lake and the South Dakota State Fair. Town images include Redfield, Gettysburg, Mitchell, Elk Point, Huron, Waubay, Hot Springs, and Pierre. Other topics include sod homes, Native American encampments, floods, railroad scenes, stone artifacts, farm scenes, automobiles, a balloon flight, baseball games, and family portraits. The South Dakota Digital Archives, an online resource, was launched in January 2012 by the State Archives to provide researchers digital access to unique historical records. There are currently more than 33,000 images available for viewing. The photograph digitization project is funded by private donations and grants. If you are interested in sponsoring a photograph collection, please contact the South Dakota Historical Society Foundation, the fund-raising partner of the State Historical Society, at (605) 773-6001.